toit by the Saxon king. 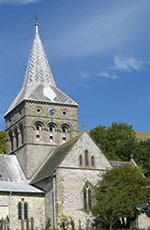 In due course the Bishops of Winchester became the Lords of the Manor and it is as a result of their patronage that the present magnificent Norman church was built from 1080 to 1150. This is the finest example of Norman architecture in the Meon Valley and the medieval populace would have known it and almost certainly been proud of it and rejoiced in it. Worship in East Meon in the Norman period would have been grand and extravagant as the bishop and his court took their places in the church, and quite unlike the rest of the Meon Valley. There would have been a sense of awe and wonder in the holiness of the whole ‘church experience’ which would have transported the villagers into another world from their humble cottages and arduous lives. It is to our loss if we have no similar sense of awe and wonder as we come into God’s presence in his house today. The most fascinating artefact in the church must be the so-called Tournai Font which is one of only seven brought to this country by Henri of Blois, grandson of William the Conqueror and brother of King Stephen. Henri was Chancellor, lived in Court House and imported the black marble fonts from Tournai in Belgium in 1150. There are similar fonts in Winchester and Lincoln Cathedrals. The carvings on the east face of the font tell the story of Adam and Eve and the expulsion from the Garden of Eden; and those on the north face tell of the Creation. There are excellent guides available in the church describing these carvings. You might like to use the Tournai Font and its imagery as a visual aid to reflect on Creation, God’s love and joy in all that he has made and on your unique place within creation. The Creation stories are told in the first book of the Bible in Genesis chapters 1-3. You might like to find a Bible and look at them now. Do you take these verses literally, as some Christians do? Or do you see them as a wonderful allegory telling us that there was a Creator and that there was a sequence and a purpose to Creation; that God has plans for His Creation and delights in it? The Bible is a coherent story concluding with the Book of Revelation which tells of the final phase of Creation when heaven and earth will be united.